IPad used to visualize data collected from a Rockwell Automation controller on a GE Healthcare bioreactor. GE Healthcare and Rockwell Automation are collaborating on a next-generation bioprocess automation platform to help biopharmaceutical companies create flexible and scalable facilities of the future, with a focus on streamlined production technologies and adaptable manufacturing environments. GE Healthcare also joined the Rockwell Automation PartnerNetwork Program as an OEM Partner to help drive a best-in-class distributed control system offering. According to GE Healthcare and Rockwell Automation officials, the collaboration can help companies gain greater efficiency with FlexFactory™ single-use equipment integrated with Figurate™ bioprocess automation that improves reproducibility, repeatability, and compliance, digitize batch files and processes to reduce review times by weeks and even achieve real-time reviews, and deliver instructions to workers with augmented reality to improve batch execution, operations, equipment setup and training. 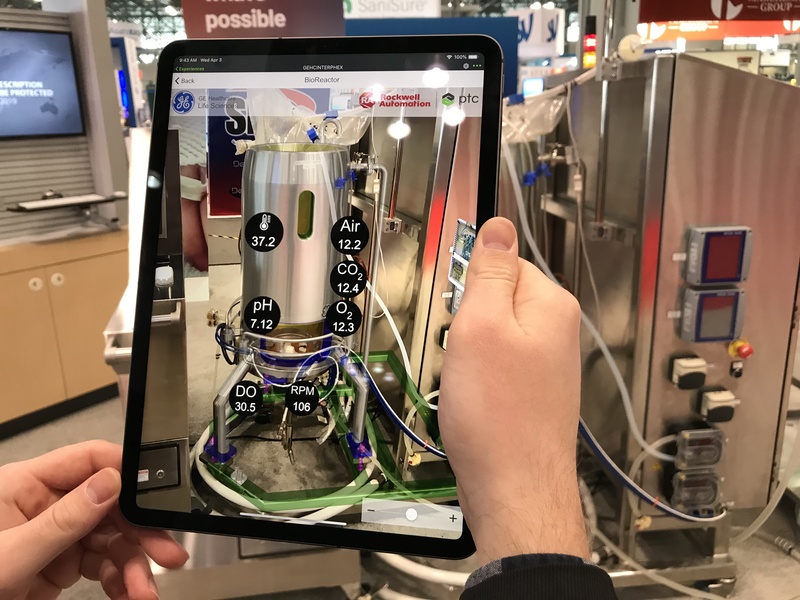 During the recent Interphex meeting in New York City Mike Brimmer, solution architect at Rockwell Automation, chose an IPad to visualize data collected from a Rockwell Automation controller on a GE Healthcare bioreactor. “The goal is to improve operators’ situational awareness as well as their ability to make better data-driven decisions,” said Brimmer, who proceeded to point the iPad screen at the bioreactor and clearly displayed several current bioreactor conditions, e.g., pH, dissolved oxygen, carbon dioxide (see photo). Automation improves operational efficiency with reduced production risk and streamlines workflows resulting in faster times to market, said Kevin Seaver. He pointed out that the collaboration leverages the combined expertise in single-use bioprocessing with deep automation and IT knowledge to turn data insights into productive outcomes.